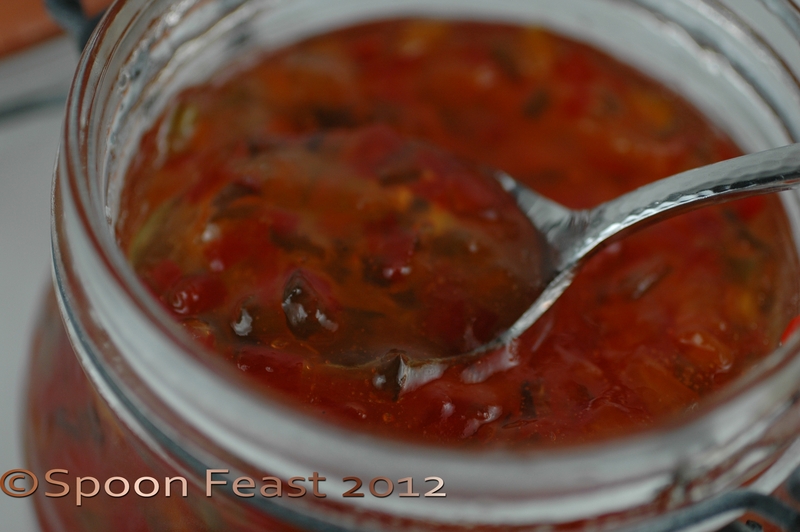 Chances are, if you live in the southern USA, you have seen and tasted pepper jelly. 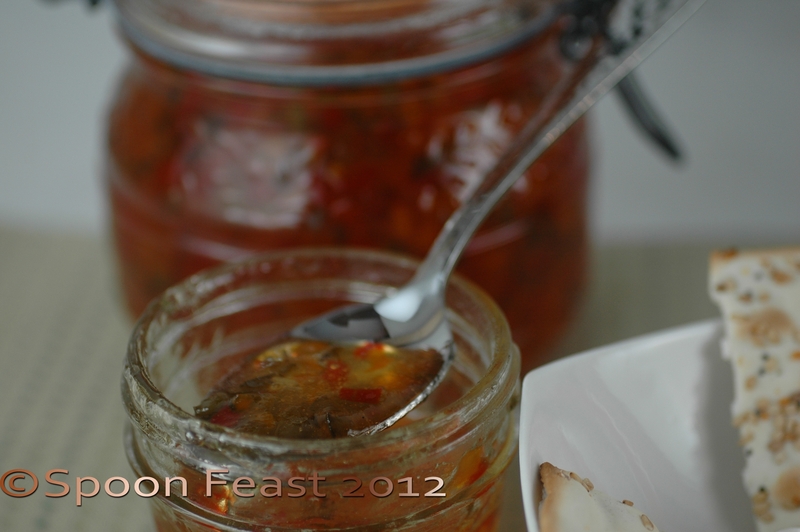 Pepper jelly is one of those staples that can be used in many things. It saves a hostess when guests show up; pour some pepper jelly over cream cheese and some crackers and you have a marvelous snack with wine, beer or even iced tea. 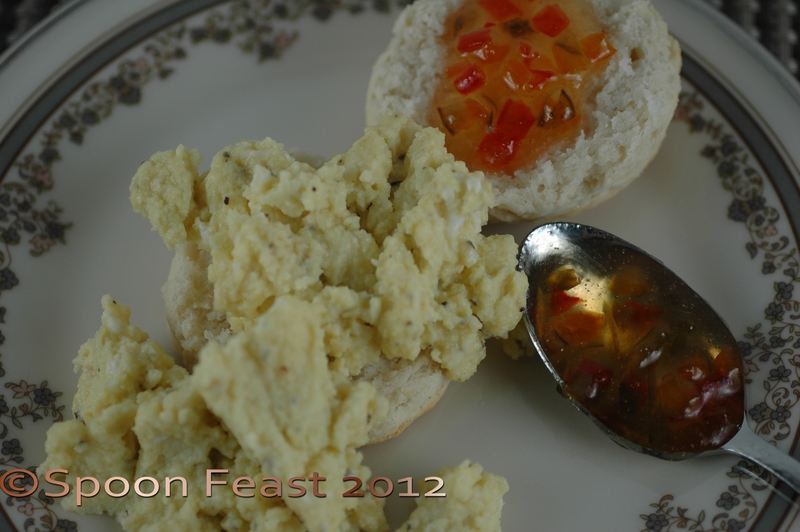 It adds a special something to pan-fried pork chops and makes scrambled eggs amazing. Slathering some onto a biscuit or over some ham will leave you in taste bud heaven. While pepper jelly is a bit on the pricy side ($4.99 USD for a small 6 oz jar) it can be made rather quickly and you can adjust the heat to make it hot or just make it sweet. When you make this, set aside time to give it your full attention because it needs to be stirred constantly to prevent lumping and scorching. As always, when working with hot sugar, be careful. Keep a bowl of ice water near your working space so if you get splashed, you can plunge it into ice water to prevent a bad burn. There are many recipes for pepper jelly. This one does not use a large amount of pectin so it sets on a medium gel which makes it perfect for pouring over cream cheese, making a sauce or slathering onto a nice hot buttermilk biscuit. Wear gloves when handling hot peppers. If you get the hot peppers on your skin, soak the skin in milk, 1/2 & 1/2 or cream. Do not rub your eyes or touch small children or babies with hands that have just handled hot peppers. Take your time cutting the peppers. The best jelly has lovely evenly diced cubes of multicolored peppers floating the jelly. If you just hack and chop, you see uneven strands and bits and pieces of peppers which isn’t so nice to look at through the jar or when you are eating the jelly. Wash the peppers and remove any sticky labels. Trim the top and bottom off, remove the stem and save the trimmed ends for kebab or in a salad or stir-fry. Remove the ribs and seeds, open the pepper so it lays flat, skin side down. See how much prettier the pepper is with the membrane removed? 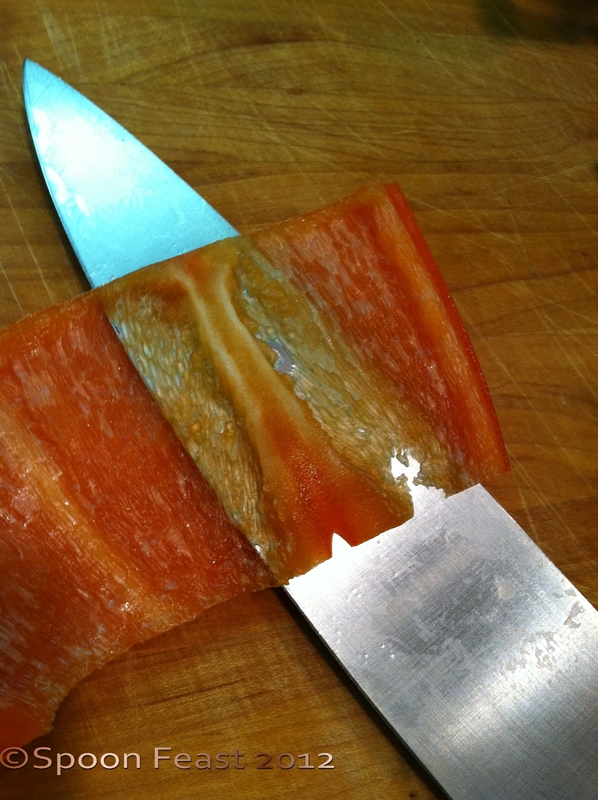 Slice into julienne, cut even slices all the way down the pepper strip. 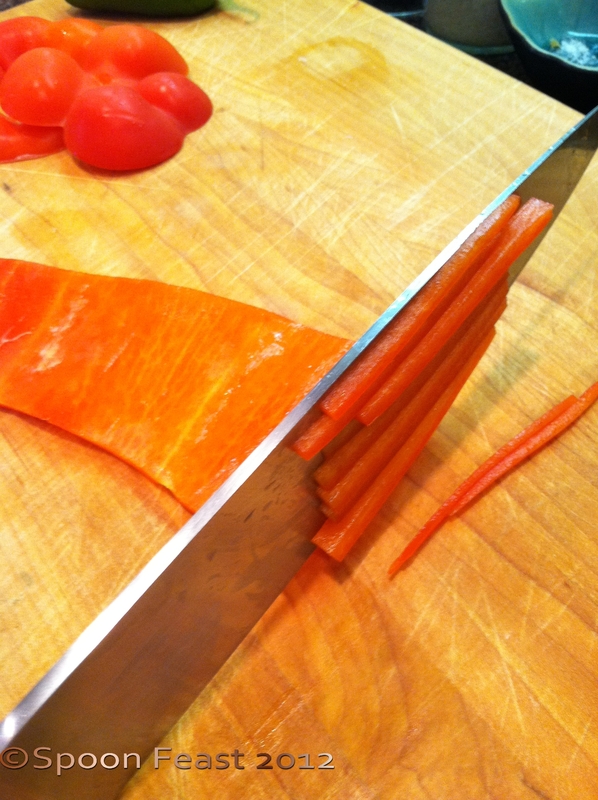 Turn the julienne and cut into dice. The cubes should be of even size. 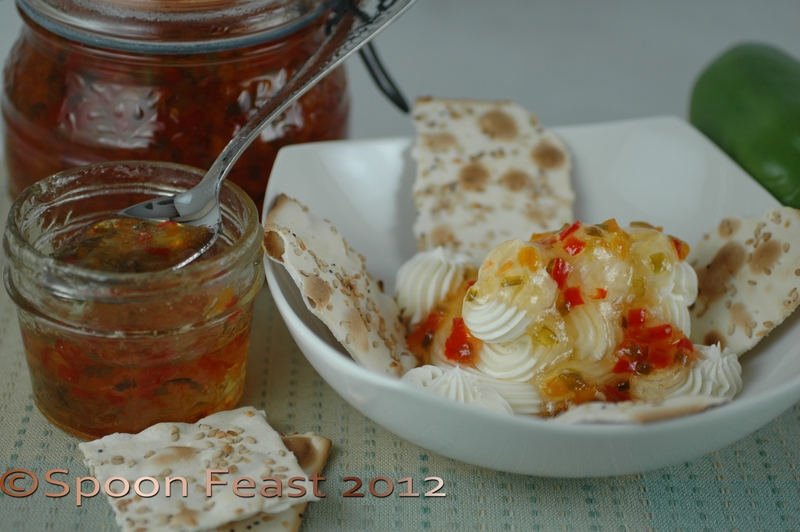 Pepper Jelly, a southern staple and hostess saver. Slice the pepper so it becomes one long strip. Lay the pepper out with the skin side down. 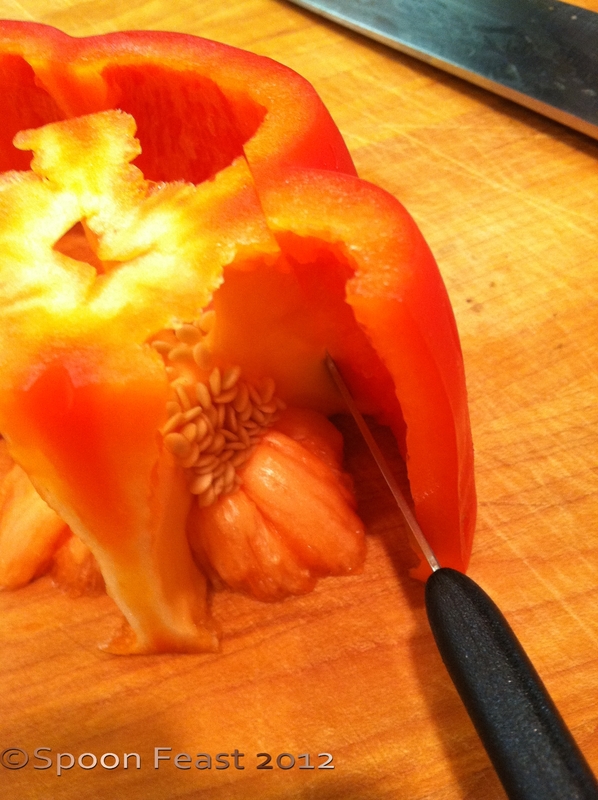 Remove the seeds and ribs from inside the pepper. 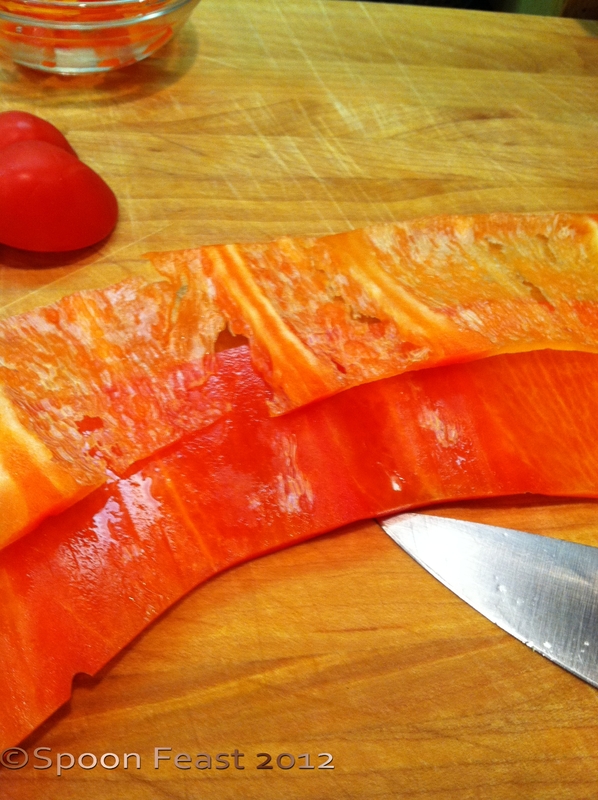 Using a sharp knife, remove the membrane from the inside of the pepper, leaving the plump pepper flesh. Just take a very thin slice from the surface to remove the membrane. 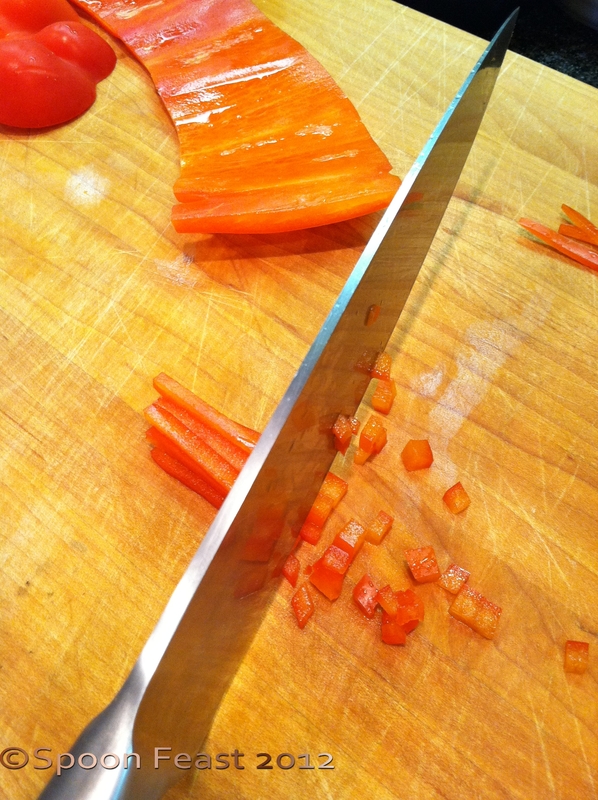 Make long thin slices from the pepper (Julienne cut), then turn the strips and cut them into cubes. Do this carefully so you create a bowl full of nicely diced peppers. Trust me, it really makes a difference to take the time to do it right. Place the diced peppers, vinegar and pectin into a saucepan. Bring to a boil over high heat, stirring constantly. Be careful of vinegar fumes, turn your exhaust fan on so you don’t get all choked up. When the mixture comes to a full rolling boil, add the sugar. Return the mixture to another rolling boil, then boil it for 1 full minute while stirring constantly. Remove from heat and skim off any foam that may have formed on the top. Or using clean, sterile jars, fill and invert them on the counter to cool. Once cool, turn them over and they seal will set, but you will need to refrigerate the jars. This makes slightly over a pint. Soften cream cheese, to fancy it up a bit, put it in a piping bag and pipe the cream cheese out in a decorative pattern rather than just plopping a chunk of cream cheese on a plate. But if you want to, you can do it that way. Lots of southern folks do. This entry was posted in basic skills, Southern Cooking and tagged Bell pepper, Chili pepper, cook, Cream cheese, Habanero chili, Jalapeño, Pectin, pepper jelly, southern cooking, southern staples, Sugar. Bookmark the permalink. We use homemade apple pectin, which would be lovely in your recipe – thanks for sharing it! Isn’t it fascinating how similar foods can be clear across the planet! Thai sweet chili sauce is probably really good over cream cheese too. I love it on noodles. I just pan fried some pork chops and put this pepper jelly in the sauce to finish it. Talk about yummy! And another post goes to draft. (Eaten before photos). Oh yes! It goes great with pork, chicken and fish. I suppose beef would be good too. I hope you like it!